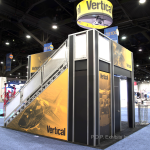 Trade Show Planning Checklist – P.O.P. 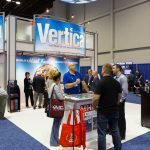 Exhibits Inc.
Planning for a trade show (especially your first) can be complicated and overwhelming. There are a multitude of deadlines to keep track of, details to plan, and logistics to be figured out. 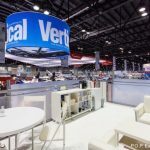 Getting some help with these things is a big reason why many companies hire an exhibit company to help with trade show planning. We at P.O.P. 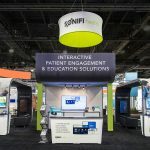 Exhibits Inc. hope to make the process a bit easier on you by helping with design questions, deadline reminders, and paperwork assistance when needed. We love it when our clients plan early for their shows! Not only does planning early help everything go more seamlessly, but it also helps keep costs down. When rush shipping and production costs can be avoided, everyone is happier. We don’t enjoy charging our clients rush charges. When planning comes down to the last minute it’s stressful for EVERYONE. □ Set your budget. Setting a goal for your return on investment (ROI) is also a good idea. Figure out how you’ll calculate your ROI. Research the show by talking to prior participants about their experiences, if needed. □ Set your goal. Why are you attending the show? Are you debuting a new product, generating leads, making sales, increasing brand exposure, or meeting with existing clients? 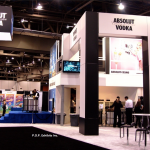 □ Identify your booth space needs and reserve your space early! Good locations go quickly. Research the show venue to find high-traffic locations that’ll give you maximum exposure. □ Review show paperwork and make note of deadlines. 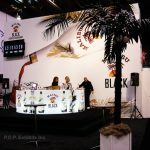 □ Start designing your trade show booth. 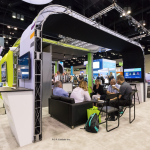 Determine the elements you need (conference space, graphics, monitors, workstations, etc.) so that you have a solid idea of where to start. If you’re working with us, this process can take a while or be relatively quick! We have clients who know exactly what they want right away, and others who go back and forth with alterations before settling on the perfect design. Either way, it’s always easier (and less stressful for everyone) when we have ample time to get the design perfect! □ Plan and prepare your booth graphics. Once we settle on a design, we’ll provide your designer with specs for preparing graphic files. We’ll give you a deadline and provide reminders. Planning early helps avoid rush fees. 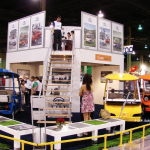 □ Write a concise but compelling sales message that gets across the key points you want to communicate at your exhibit. Rehearse it with your staff so that you can use it confidently on the show floor. □ Place your orders for electricity, rigging, cleaning services, and flooring (if your exhibit company isn’t providing). We’re happy to help with electrical and rigging order paperwork. □ If you’re launching a new service or product, confirm it’ll be ready for the show. □ Plan your giveaways/handouts. 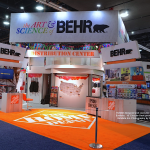 Determine the marketing and literature materials you’ll need and begin design and printing. □ Finalize your trade show team and order uniforms, if needed. Make all travel and hotel reservations for you and your team. □ Choose your vendors and make sure they’re clear on dates/deadlines. 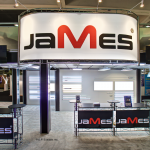 If you’re renting your exhibit through us, we’ll handle shipping, I & D and storage for you! Otherwise, you’ll need to coordinate shipping, installation, dismantling, and storage vendors. □ Confirm all dates and details with your shipping, installation, and storage vendors. Exchange contact information with your install crew. Finalize payments with your vendors. □ Start marketing your show presence. Use social media to your advantage! Let people know you’ll be at the show and where to find you. Contact target clients/distributors and set up meetings in advance, if possible. □ Make sure your staff is trained and sales pitches rehearsed. Everyone should be able to answer questions about your company, products and services. □ Execute your plan and reach your goals! □ Keep your booth staff motivated. Provide snacks, water bottles and breaks. Trade shows can be long and tiring. Don’t let unhappy employees cause a bad impression at the show. □ Keep careful track of contact information collected at the show. □ Review your objectives from your plan and evaluate the success of the show. Is it worth attending next year? What changes could be made to improve success in the future? 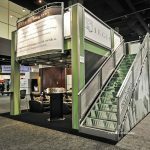 Previous PostPrevious Double Deck Booth Benefits- Let us help!